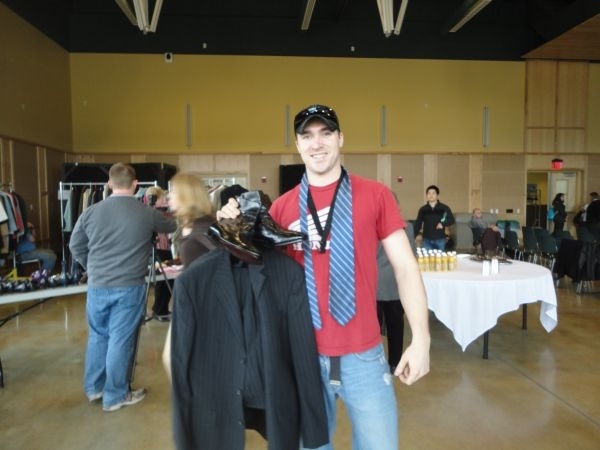 So, one afternoon last week students at Lyndon State College were given a chance to select what they needed to dress for a job interview and take it away for free. (Announcer) "So, the purpose of this fashion show is this is going to give you the dos and the don’ts of the interview process and how to look during that." (Zind) Imagine you’ve put four years of hard work into a college degree only to be undone by the clothes you wore to an interview. Wrinkled or mismatched clothing, showy jewelry, that ill-fitting suit last worn in high school: All are no-nos that students now know – if they attended Lyndon State’s Center For Rural Entrepreneurship Dress For Success event this week. (Announcer) "…notice that the belt and the shoes match, which is extremely important…"
(Zind) A fashion show with examples of good and bad interview dress was just one part of Dress For Success. There were also tips on what to say in a job interview. (Speaker) "In the initial interview the first question will either be, tell me a little bit about yourself, that open-ended thing for which you should have your story ready, or why are you interested in this position?" (Zind) The biggest turnout at Dress For Success was for the free clothing. As a trio of students provided background music, graduates-to-be scoured racks and tables of dress clothes donated by people in the community. (Hilliard) "If you don’t feel comfortable with conservative, don’t even look at one, because you don’t want to get a suit you don’t feel good in…"
(Zind) That’s Wendy Hilliard, one of Lyndon State’s non-traditional students. She’s helping her younger classmates try things on. There’s even a seamstress on site to help with alterations. Senior Simone Tefts of Burlington recently spent 600 dollars on clothing for a future career in education, so she knows how much it can cost to dress for work. (Tefts) "I need a business suit for interviewing and obviously I’m not going to pass up a free one." (Zind) Tommy Russell is a business administration major from Barton. His wardrobe is short on dress clothes and he knows he’ll need something more to get his first job out of school. (Russell) "Just a business suit. Something I can get for my first big time interview." (Zind) Russell hopes the suit he walked away with will help put him on a career path that leads well beyond the Northeast Kingdom and the borders of Vermont. (Russell) "My passion is auto body work. I’d like to try to get into that, open up my own place and eventually get more locations throughout the United States." (Zind) There’s a playful atmosphere but there’s also serious intent behind Dress For Success. About forty percent of Lyndon’s students are from the Northeast Kingdom, which lags behind the state economically. Many commute to school from home. For some the cost of good clothing is no small expense. Former Employment and Training Commissioner Steve Gold is Lyndon’s interim president. (Gold) "It’s a significant economic barrier. I mean, an investment in a suit is way more than a lot of these kids have the ability to afford." (Zind) In the end, Lyndon students took away two dozen men’s and women’s suits and many more shoes, ties, shirts and jackets. Organizers say they’re pleased with the turnout and plan on holding another Dress For Success event next year. VPR news, I’m Steve Zind.